Where Do Your YouTube Viewers Bail? I don’t need to tell you that video is an important component of any content production effort nowadays. The stats demonstrate that: every 60 seconds there are 24 hours of video uploaded to YouTube alone. This means that there’s no way to stay caught up, but it also means that there are a ton of people consuming video. Do a Google or Bing search and it’s quite common to see videos appearing as top search results too. You can easily see how many people watched your video on YouTube and even see if people liked it or not, or left comments, but if you’re posting five minute videos that you’re convinced are super interesting, does your audience agree? Remember, the “viewers” stat refers to the number of people who began watching the video. If ten seconds in they say “Yikes!” and bail, it counts the same as someone who watches the entire video and visits your site for more information when they’re done. That’s why YouTube has some pretty slick analytics available to anyone who uploads video. What surprises me is how few people know about it, even people who are enthusiastically uploading video on a regular basis. Perhaps it’s denial since it can be such a stark reminder that what you find compelling someone else might find boring and unengaging? Let’s hope not! I produce a lot of videos myself and I know that there’s a pretty consistent drop-off in user-produced video viewership. I imagine that an episode of Big Bang Theory or the ten scariest minutes of a new horror film have very different viewership patterns, but for us small players, having people watch a few seconds, or a minute, or get half way and then lose interest is to be expected. What I look for are points during the video where the retention graph changes, either suddenly going flat, meaning that spot is extra engaging, or suddenly dropping, meaning that there’s something about that point in the video that causes lots of people to bail. You can see what I mean now. In general, the further into the video, the more likely a viewer is to bail out and stop watching. 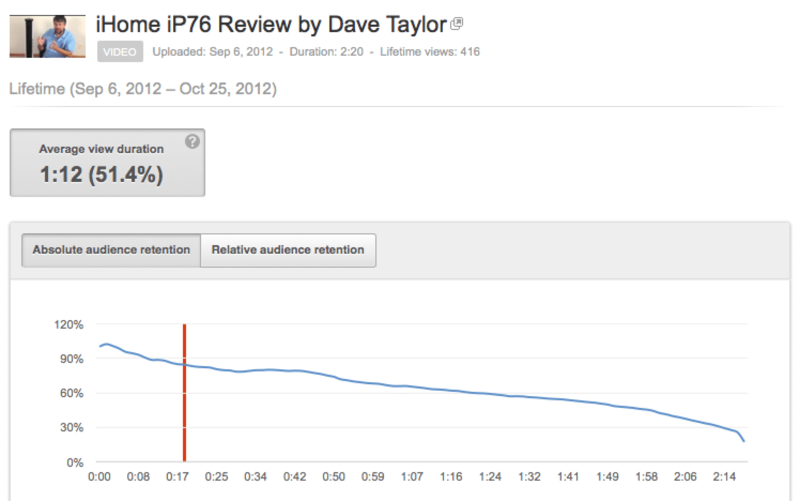 In fact, the video is just over two minutes long and the average viewer sees about half, bailing at 1:12. I think that’s pretty good, actually, in our highly ADHD world when they’re on YouTube, a click away from millions of other videos. Look closely at the graph, though, and you’ll notice something curious happens around 0:34 where retention improves for about seven seconds before resuming its usual slope. Conclusion: Whatever happens in the video at that point is good and creates more viewer engagement, sufficiently so that everyone who gets to the beginning of that passage sticks around for the next ten seconds or so. As a feedback mechanism, that’s obviously something to study and duplicate in other videos! And those closing titles we like to add as video producers? Notice the last few seconds of the graph: when people know they’re at the end, they leave, they don’t wait to read the credits. You see this in a movie theater too, when we get that last fade to black, people are up and out. There’s a lot you can learn from studying your YouTube analytics. This is just the tip of the proverbial iceberg. And video production? Well, you do know that I am offering a session called “Quick and Dirty Video Production Workshop for Your First YouTube Video” at New Media Expo next month, right? You won’t want to miss it! 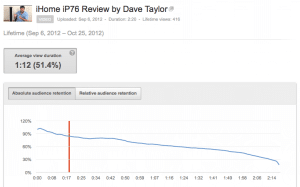 Dave Taylor has produced short-form tutorial videos for Intel, Kingston, BlitzMetrics and many other companies, along with a lot of his own work. You can find his YouTube channel at youtube.com/askdavetaylor and you can learn more about his video production at ADT Video.com. You can find him on Twitter as @DaveTaylor.